SureSafeGO is a fully mobile personal medical alarm for the elderly and those with a disablilty, offering protection both at home and outdoors (e.g. the shops, walking, etc.). It includes a two-way communication talking pendant, call and text alerts when activated, a ‘find me’ feature and automatic fall detection. Stay safe with a SureSafeGO, wherever you are! The SureSafeGO ‘Anywhere’ Alarm is a fully mobile medical alarm with an advanced fall detection feature. It uses the latest communication technologies, letting you raise an emergency alarm at the touch of a button, so that you can get help quickly and easily the moment you need it. SureSafeGO does not require a landline connection, and it uses mobile phone technology via a SIM card. You can choose your own SIM or let us organise one for you. The device is ready to use straight out of the box, providing instant coverage once set up and activated. If you press the SOS on the pendant, it will activate a voice call and send its location to 5 emergency contacts via google maps link. You can then talk into the pendant to provide more details of your situation. Gives protection anywhere you have a mobile phone signal, whether you’re home or ‘out and about’. No one wants to be stuck at home or worried about leaving the safety of home. With a SureSafeGO, you will be protected everywhere so you or your loved one can live an independent life more confidently and securely. Many alarms on the market will only activate if the button is pressed, but the SureSafeGO has an automatic fall detector that senses a fall and activates the alarm. This is extremely useful because some falls can render victims unconscious or immobile and impair their ability to get help. Quickly finds where the pendant is located by sending a PING request. This is an incredibly handy function for people who wander and get lost easily. Creates a safety zone or virtual fence for better monitoring and protection. If the pendant goes outside its predetermined area, all contacts are immediately notified. Depending on the use of the battery, the SureSafeGO ‘Anywhere’ personal medical alarm will last approximately 2-3 days depending on use. You can change the settings to extend the battery life to over a month. The hyper charging cradle will re-power the device to full power in about 2 hours. This simple and free-standing charging station is intuitive and easy to use, making recharging your personal alarm a breeze. Step-by-step instructions are included with every unit, so you can know every feature and function. You can also call us for free on 1300 739 991 to speak to a technician if you have any questions about its setup and features. 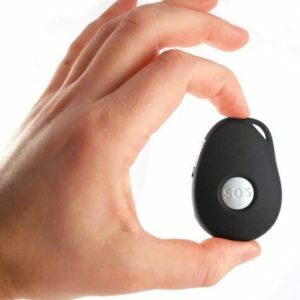 The SureSafeGO personal medical alarm is small and light, measuring just 61x42x16mm and weighing less than 40 grams – you will hardly notice you are wearing it! This small and lightweight design allows you to bring it anywhere with you easily, making it more convenient to get full monitoring and protection no matter where you go. The SureSafeGO anywhere alarm is now available as a wrist band and also as a belt clip. The SureSafeGO is all about independence. The new wearable options, give you the flexibility to wear the alarm in a way that suits your lifestyle and needs. If you need help or emergency assistance, simply press the SOS button on the front of the device. An SOS text message alert is sent to the nominated contacts. The text includes a Google Maps link which shows the location of the wearer at the time of activation. The SureSafeGO then calls the 1st SOS contact. The SureSafeGO’s two-way speech allows the wearer to talk into the pendant directly and communicate with their contact. If the first number doesn’t answer, the SureSafeGO will continue to call the 2nd contact, and then the 3rd etc. Additionally, you can find out where the SureSafeGO is at any time by simply sending it a text message. The device will then automatically reply with an update on its location with a Google Maps link. Get comprehensive monitoring and complete peace of mind for yourself or your loved one with the SureSafeGO ‘Anywhere’ alarm. It provides the reliable coverage and fall detection functionality you need to let you or your loved one live more independently. Whether you use it at home or outside, the SureSafeGO ‘Anywhere’ personal medical alarm will keep you better protected and more accessible for emergency respondents. Make your purchase online or phone 1300 739 991 for more information.